The Selvaggio Blu wends 25 miles along the east coast of Sardinia, over cliff faces and in between beaches. At 5:58 p.m. on a sultry June afternoon, I arrive at Cala Sisine beach, hot, heart racing, legs covered in red dust, hair full of twigs and caterpillars. But, given what has transpired over the last 12 hours, I feel surprisingly strong. 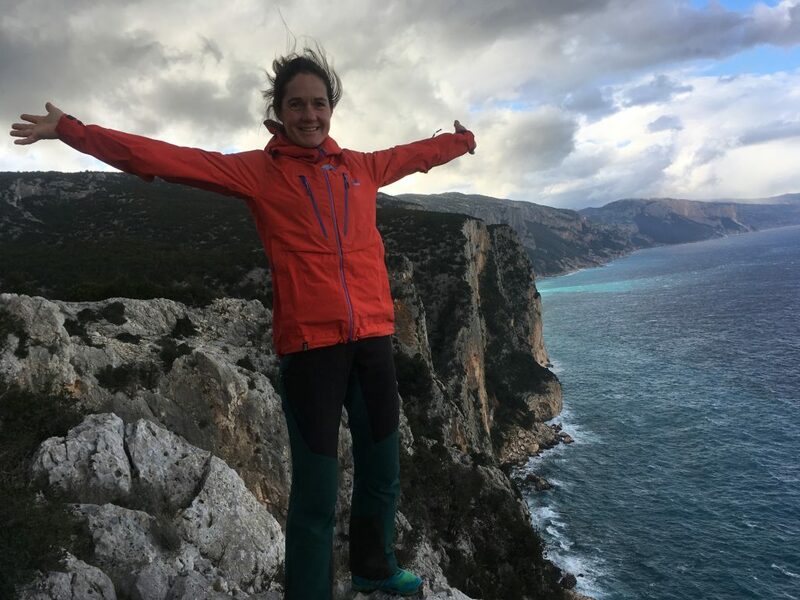 I am on the mediterranean island of Sardinia, and have just completed a thru-run along the Supramonte, a wild tangle of limestone along the island’s central-east coast. Uninhabited and inaccessible, the Supramonte is a complicated labyrinth of cave networks, deep canyons, soaring cliffs, twisted juniper trees, holm oaks and precipitous drops to a shimmering turquoise sea. 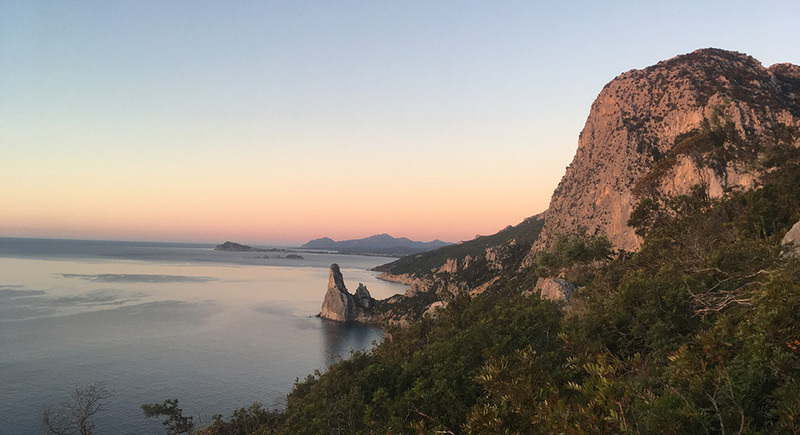 The route that follows this remote coastline northwards for 25 miles, from Pedra Longa to Cala Sisine, is called the Selvaggio Blu—Wild Blue—and is considered one of the finest and most difficult treks in the mediterranean. The Selvaggio Blu involves short sections of rock climbing and rappels up to 40 meters, linking old shepherd paths and mule tracks abandoned since the previous century. The route is, at times narrow and exposed, often indistinct and has no official way markings. There are also no sources of drinking water. Conceived and first completed by local guides Mario Verin and Peppino Cicalò in 1987, the original trek was divided into four stages covering between seven and 12 kilometers each day. 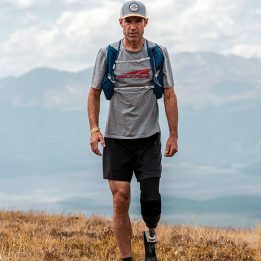 Each leg typically took between six and nine hours. 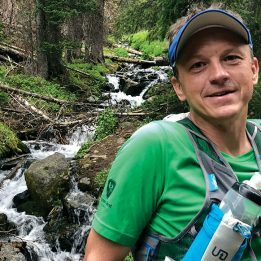 After I did a brief section hike there last January, the seed of an idea took root in my mind: running the Selvaggio Blu in a single day. And so I find myself setting off from Pedra Longa at six a.m. on a mild, mid-June morning, with the warm orange glow of sunrise lighting the trail. The trail climbs steadily along a ledge and gains a plateau with a small shepherd’s hut before breaking southwest toward the cliff top. Sprawling juniper bushes force the trail into twists and turns while hidden gullies plunge me into dead ground and steal my horizon. There are faded paint splashes … a few cairns … a cairn … and then nothing. There’s a faint footpath … but where are those faded blue marks? I slow to a walk, reluctant to retrace my steps. I know I’m losing time and that the day is growing warmer with every minute. But I also know that if I’m wrong and I keep going, I could get hopelessly lost in this intricate and unforgiving maze. I stop and get the map out. I’m already hot and a little thirsty, but slowly I start to understand where I’ve gone wrong. I have covered quite a distance on phantom paths. For the first time, my conviction that a one-day Selvaggio Blu is easily within reach begins to waver. I look around, and see a shallow couloir to the southeast. The cliff edge lies beyond that. That’s where I need to be. I take a sip of water, banish doubt from my mind and start to cut cross-country towards the sea. The undergrowth is relatively open and I make good progress. In a short while I gain a shepherd’s hut hidden in the woods. A little farther, I pick up a line of cairns. This is good. Finally I see a familiar gate. I know where I am. I’ve lost an hour, but I haven’t lost faith. I take a deep breath and surge down the rocky slope with new energy. I weave through woods, cross scree slopes and round rocky buttresses, playful terrain suspended airily above the hypnotic sea. The trail—familiar now—moves effortlessly beneath my feet. Soon I’m onto the first steep section, which is fixed with “rungs” of juniper wood. Voices echo up from below and I burst past a group of startled trekkers. I smile and greet them as I pass, swinging down into the trees below. In the shade I drink some water, quietly noting how much remains, then launch upward into the bright, burning sun and the first section of easy climbing. I crest the ridge, descend immediately and find the trail, thin and sinuous but weaving relentlessly in the right direction. I can feel my reactions slowing in the heat. My thoughts seem strangely detached inside my head. I fail to duck in time and a juniper branch as solid as stone catches me square on the forehead. I am eight kilometers from my first water cache, and I only have half a liter left in my pack. Finally, seven hours in, two stages down, I gain my first cache. I pull back the stones thirstily, relieved to find the water still in place. I refill my bottle, add some salt tablets and drink a liter before pouring the remainder through my matted hair. I crush the bottle, shove it in my bag and set off again along the crest of Serra e Lattone, toward the sea. From here the terrain becomes more interesting still, and more beautiful, weaving through trees, crossing rock shelves and scree slopes, traversing calcified caves draped with stalactites and scrambling around exposed buttresses. Before long, I reach the first of a series of rappels down to Arco Su Feilau, a natural arch. The final stage is more runnable, with long straight sections through shaded woodland, soft underfoot and without too much ascent or descent. I take 10 minutes at Oville Piddi—my second cache—to eat and drink, enjoying the view. Up until now, my goal had been to complete the trail in a single push. But it is becoming clear that I will finish around the 12 hour point. The number starts to take on a powerful significance. With warmth and humor they let me go first. The minutes pass quickly, and I gain the woods just south of Cala Sisine. Down another, final rappel, I coil the rope, throw it into my pack. I feel the Selvaggio Blu retreat behind me. The trail is clearly defined, pulling me forward though a gently sloping tunnel of arched branches, toward the hidden beach below. I burst from the trees into the dazzling sunshine, hot, heart racing and legs covered in red dust. Eleven hours and 58 minutes. I can’t stop smiling. 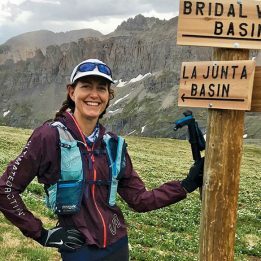 Tania Noakes is an adventurer, writer and IFMGA Mountain Guide. She is a member of the British Mountain Guides Association (BMG). 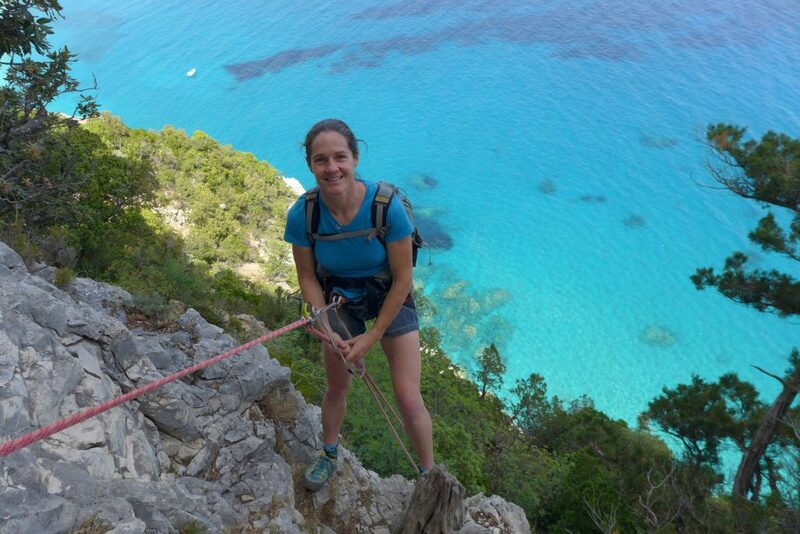 She will be organizing and leading treks along the Selvaggio Blu in Sardinia in the fall and spring months. Contact her for more information through her website www.classicclimbs.com or by email on tania.noakes@gmail.com. What an inspiring article, was mainly aiming for the traditional version of the trek but the day trip sounds intriguing!